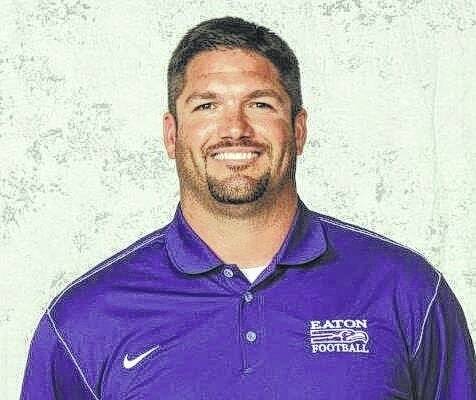 EATON — After nearly three decades, there is a new face to Eaton football. Brad Davis was named the Eagles’ next head coach in mid-April after Ron Neanen announced his retirement in March. But while Davis’ reign as head honcho is still in its infancy, his roots to the program date back to his adolescence. He is a 1997 Eaton graduate, having played for Neanen before attending Western Kentucky University where he played for (former Eaton coach) Jack Harbaugh. He rejoined his high school coach in the summer of 2004 when he accepted a teaching position at Eaton. Davis started as a special teams coach before taking on defensive coordinating duties in 2009. He has remained in that role until Neanen’s retirement. Davis said it’s difficult to be the successor of an already-successful program, but acknowledged that the road has already been paved for him. While Davis understands that the foundation has been laid, he is looking to bring his own style to the program. The scheme will be slightly different due to his defensive mentality and the fact that the entire offensive coaching unit has left the program, but it shouldn’t stray too far from the brand of football Eagles’ fans have become accustomed. But Eaton football is Eaton football. Davis was coached by two men who both had the same philosophy and he is looking to keep that tradition going. Although the road has been smoothly paved for Davis, Eaton did have one of their worst seasons in the school’s history last year. The three-win season was a tough way to send off Neanen, said Davis, but it also provides an opportunity for this upcoming year. That opportunity and that challenge, in a roundabout way, is what motivated Davis to accept the head coaching position. When Davis arrived back in his hometown in 2004, his plan wasn’t to stay here for long. But things changed – he met his wife and started a family here. And come August, he’s hoping to continue with a good football program.